While it might seem like March centers on shogi, the game itself isn’t quite as a relevant as what it means to the players. Shogi works as a centerpiece that brings all these people—with their different life experiences—together, but what really sticks out is what the game does to its players. The careful exploration of each of its character’s lives and struggles, and the way the show uses the world that surrounds them to reflect their emotional states, are the strongest points of the show. We see characters surrounded by snow, struggling to keep swimming, falling off cliffs, or drowning in water. Sometimes we see them consumed by darkness or drifting away, surrounded by colorful lights. We see soft and warm pastel worlds and worlds devoid of color. There’s tremendous value in seeing mental illness, trauma, grief, and the other afflictions these characters have portrayed with so much complexity and care. However, there’s something else in the show that is just as important: the hope that no matter how hard things are, it can get better. It’s a slow process and it’s not pretty or easy. There are some things that just can’t seem to ever go away. There are times when it seems like there’s nothing to hold on to, and even the smallest things become huge battles. Still, our burdens can always become a little more bearable with the support of the people that care about us. We can see that with plenty of characters, but it’s especially noticeable with the protagonist Rei, and in one of show’s the latest arcs, with Hina. When Rei tells us about his childhood, one of the things he remembers is the always-empty seat at his side on the school bus. That empty seat tells us a lot about how he spent most of his days: silent, absorbed in his own world. Lonely. In shogi, Rei finds something he’s good at. This doesn’t mean the game never brought him any pain—far from it. Still, it’s what allows him to have economic independence and, in some ways, perhaps even freedom. For better or worse, it also keeps him busy, which is something I can understand from personal experience. Maybe it was the tone of my voice, maybe I looked as small as I felt, because I can still remember how their expression softened. They answered, “They should find something they’re good at, and focus on that.” It sounded reasonable enough to me, and I ended up focusing on books. It would take me years to realize that, while books entertained me and gave me a lot of solace, they didn’t make the problem go away. Shogi doesn’t make Rei’s problem go away either, nor did it ever help him get better. It merely helped him survive. It’s not until Rei meets the right people that things start to get better. When he meets the Kawamoto sisters, he finds the warmth and acceptance that was absent from his life for so many years. Still, while the family causes a strong impression on him, they don’t touch him immediately. Loneliness might be harsh, but seeing beyond our pain and having the courage to reach out can be even harder. It’s not an overnight change, either. After being alone for so long, it takes time before Rei stops feeling like an intruder in their home. The Kawamoto family always receive him with open arms, especially Akari and Hina, but it’s not easy for him to see that. It’s a long process, but it’s also a very rewarding one. As he begins to accept that he’s truly welcome in the Kawamoto household, he also begins to see the support that surrounds him elsewhere. At school, he has a teacher that never seems to be able to leave him alone and, at some point, Rei even begins to go to him when he needs advice. He’s even able to become part of a club, and the warmth he feels when he realizes he’s able to fit in is also something that I can understand from experience. There are also other seemingly little things, like all those missed calls from his (worried) adoptive father when he gets so sick he disappears for a few days. There’s the support and understanding he receives from his friend and self-proclaimed rival Nikaido as well, which takes time for Rei to see. Love is important, but there are times when love alone can’t fix everything. Sometimes the struggle is too great and the support of the people around us alone can’t reach us. This is what happens with Chiho, Hina’s friend. After being heavily bullied, Chiho had to go away and get professional help to begin healing, and that’s okay. The show itself understands this; the atmosphere with Chiho is covered by peaceful and relaxed pastel tones. Her therapy is portrayed as her safe place. As someone who has felt how hard it is to reach out and ask for help, this was honestly comforting to see. Still, March understands that even if we need extra help, having love and support in our lives is still fundamental. Hina never stops writing letters and checking on Chiho, who notably moved to a place where she would be closer to her dad. Her treatment itself is carefully tailored to help her slowly reconnect with people. This is seen in the Kawamoto household as well, especially when Hina also falls victim to bullying as a consequence of standing up for Chiho. 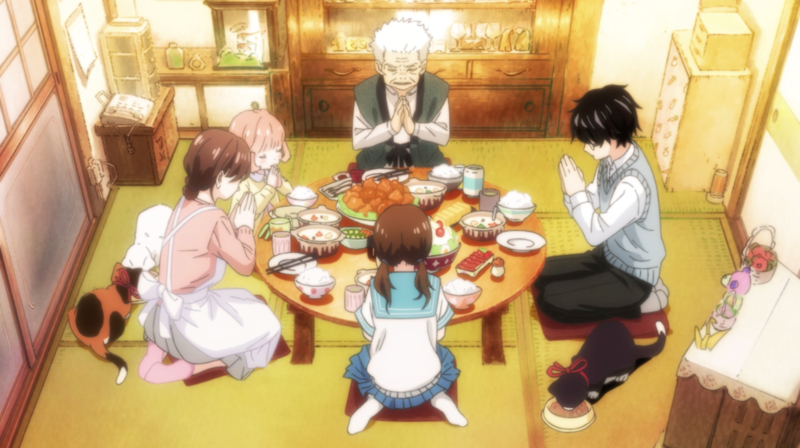 When Hina is at her lowest, her grandpa makes a point of telling her that he admires her for doing the right thing. Akari, her older sister, makes sure Hina understands that she’s not alone; whatever she needs to face, they’ll do it together. It’s just as important to see how these people reciprocate their feelings. Akari is there when Hina and Rei need her; and when Akari is at her lowest, these two want to find ways to help her as well. In the same vein, Hina and Rei mean a great deal to each other. When Hina defends Chiho, she doesn’t only help her friend, she helps Rei as well. In Hina, Rei sees someone who genuinely cares for those who don’t fit in. It makes him feel seen and understood, which is enough to alleviate some of his pain. Rei’s own experiences mean he understands the hardships Hina goes through. When Hina gets isolated from her group in a school trip, Rei is able to guess how bad she feels about it, and his presence alone means a lot to her. Instead of ending the trip with painful meanings of feeling inadequate, Rei reminds her that she has people in her life who care about her. Hina is a strong and brave girl, but she’s not unbreakable. Those little moments, those little gestures of support from the people around her are what help her stand tall and proud—even through tears—in moments where she would have broken down if she was by herself. Very much like in real life, in March everyone struggles with something. Following these characters can often be painful and infuriating, but it can also be cathartic. March is not interested in comparing “who has it better” either. For this show, these characters are all warriors. There’s a lot of empathy and understanding in the way their struggles are portrayed, and even if they can’t always overcome the walls in front of them, the show sees a lot of strength in simply standing up to face them. When things get rough, a large part of their strength comes from the support of those around them. Sometimes, this even inspires others, myself included. I’m thankful that March exists, not only because it makes me feel understood, but because it promotes something valuable that took me years to understand. I cannot stress enough how valuable it is to see yourself represented. The existence of a character like Rei Kiriyama—who’s treated with care by the story—doesn’t only makes me feel understood, it reassures me that I’m not alone. There’s comfort in knowing that there are people out there (both real and fictional) who also share your struggles, because it tells you that you’re not “abnormal” or “a failure” for feeling that way. I also take a lot of value in seeing the show flesh out characters from diverse age-ranges with diverse problems, because it reminds me that I should try to expand my perception and become more empathetic. Even if things are rough at the moment, it can get better. Sometimes better is not entirely healed, sometimes we have to learn to live alongside some battles. Still, your lowest point doesn’t have to be your whole life. It gets better. Marion writes about anime and related geekery. You can read more of their rambles at Otaku, she wrote, watch their video essays and compilations, support their work via Patreon or just hang out with them on Twitter.